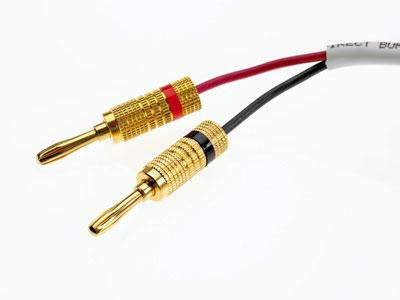 Speaker wires are frustrating because they don’t have actual plugs. Instead, the wires are merely left exposed. This doesn’t stop you from hooking your speakers up to your stereo receiver, but it does result in a messy, disorganized look and can make installations more difficult. Here’s how to install banana plugs to your speaker wire, so you don’t have to deal with the messiness of the exposed wires anymore. Using wire cutters, trim your speaker wire. When you buy speakers, you’re generally given a lot more wire than you need. This is because people choose to install their speakers in lots of different ways, whether by mounting them on a wall or just setting them on a bookshelf, In most cases, though, you’ll have so much leftover wire that it will just contribute to the messy tangle of cords behind your entertainment center. Determine exactly how much wire you need for your installation, and then cut the rest. You’ll also have to strip the cable after you cut it, to expose some of the wiring and make it possible to install the banana plugs. Strip away about two inches of the wire jacket from the end of your wiring. The wire jacket should obscure two different wires, one red and one black. Unwind them, then use your wire stripper to take off about 0.75 inches of the red and black covering from each. With the actual wiring now freely exposed, you will be able to install the banana plugs. Each of your banana plugs should be color coded: one black and one red. Unscrew the bottoms of the plugs, then feed the corresponding color wire into each plug. Apply pressure until you feel the wire hit the front of the plug. Then, screw the back of the banana plug back in to hold the wiring in place. Installing banana plugs on your speaker wire is a simple process that can go a long way toward making your speaker system cleaner and more user friendly when it comes to installations. Just make sure you leave enough wire in place to reach as far as you need it to!